inforoo poster, in an actual poster im pretty sure the dates wouldn’t cover the band name.. This is fake. It was made on inforoo. Too many big, BIG names. I dont buy it. It is fake we made it on inforoo, nice try suckas!!!!! 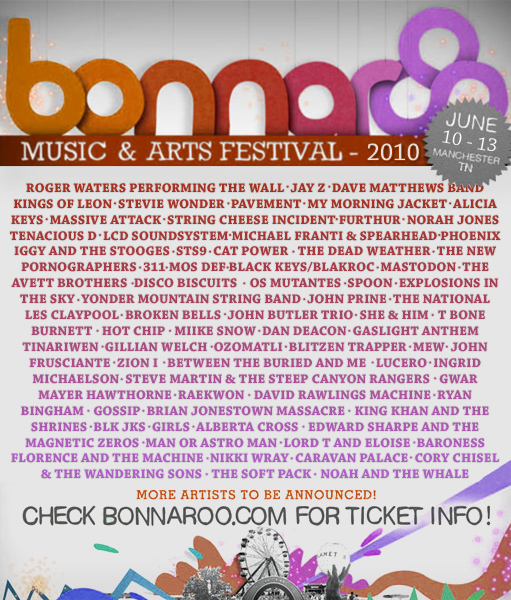 bullcrap… bonnaroo.com just updated their website, it doesn’t look a damn thing like that. On a couple of Roger Waters websites it is rumored that he will be touring The Wall in 2010/11. Probably similarly to what he did in ’06 with Darkside. My other problem with this poster, why would Furthur be hidden on the 3rd line? But The Flaming Lips doing Darkside of the Moon. Zach Brown and DMB have been confirmed as well as Pavement. Also, not confirmed by Roo but in articles Paul Simon. Ahh yes, and MMJ have an open spot in there tour during the Roo dates.